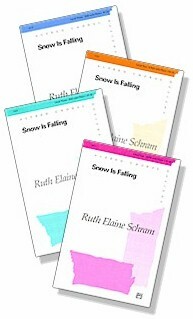 The ACDA Choral Journal called this Ruth Elaine Schram text "intelligently written and highly poetic," an "enchanting work." 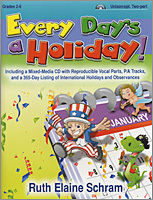 This sensitive, expressive lullaby is destined to be a classic for ladies voices. The wonderful Christmas story is painted in hushed tones and gently brought to life. Suitable for school or church use. This best-selling anthem is based on the well-known Christmas carol "Stille Nacht," but set in 4/4 rather than the traditional 3/4, giving the melody a more relaxed feel. An original second melody (with original lyrics) works alone or as a lower descant or counter-melody. The lush keyboard part may also be used as a piano solo during the holidays. 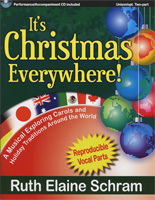 Wonderful addition to your winter concert, this expressive song depicts the beauty of the falling snow as it "...turns a dreary morning to a magic winter day..." The original two part and SSA voicings were so popular, SATB and SAB voicings were added. Beautiful piano accompaniment supports the voices.